Thanks to the Insta fairies 🧚🏽‍♀️Anne Therese and I connected last Spring, and when I read the mission of Role Models Management, the ethical modeling and talent agency she co-founded with partner Val Emanuel, I was so excited! Finally, I thought, an agency with standards that’s attracting models with VALUES like social and environmental responsibility, ethical manufacturing, body positivity and being agents of change. 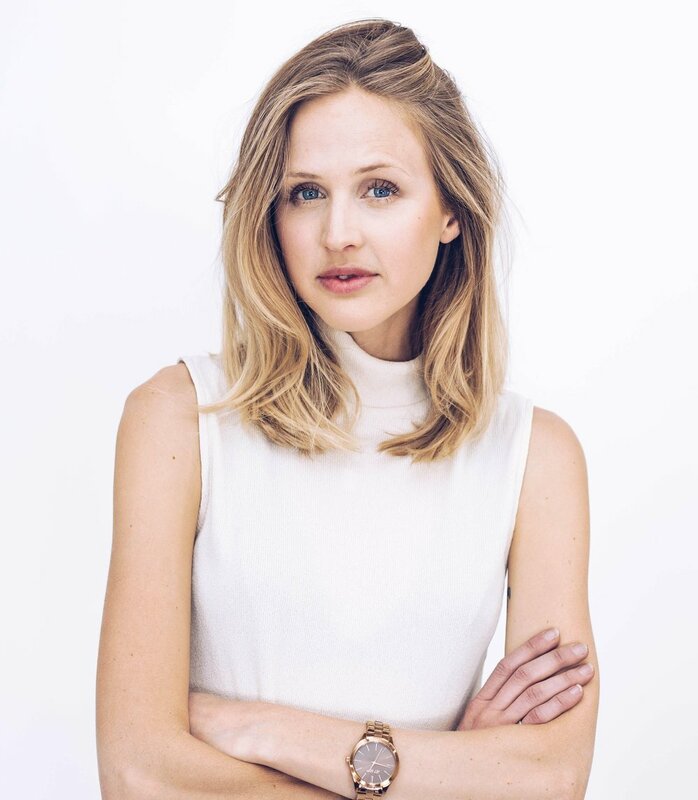 As a model and conscious entrepreneur herself, Anne Therese does not take her position or her platform lightly - she is consistently showing up with a positive outlook and a focus on how we can take action together. On her Hey Change podcast and site she shares even more resources like great organizations to get involved with, books to inspire you, sustainable fashion brands and what’s in her zero-waste kit. Several of the amazing women we’ve interviewed here so far are represented by Role Models Management, so thank you to Anne Therese & Val for connecting us! Q: What inspired you initially to start modeling and to co-found Role Models Management, an ethical talent & modeling agency? A: My journey to modeling was probably a bit unique since it wasn’t so much the modeling itself that drew me into the industry, but the thought of what I could do with it once I had established myself as a model. I was in my early twenties and had just moved to New York, and was on my mission as an eco-warrior where I wanted to inspire the world around me to care more for the planet. I thought that maybe modeling could help me create a platform where others would listen. My plan was: become a model, earn that “cool” status, and then use that for social media growth to spread my message. I wanted to “model for the right things” and show people that you can still live a fashionable, modern life and also be conscious and lower your impact for a sustainable future. That was my plan. However, as a signed model in New York I was still lacking that empowered voice I wanted so badly. I soon realized what the industry really looked like on the inside. It became clear to me that models aren’t asked to share opinions, rather, they shouldn’t say anything at all. Show up, be on time, pose in front of the camera, done. After working so hard to get my foot in the door, this was the opposite of what I wanted, and I felt a huge disconnect right away. I thought that there must be other models out there that felt the same way — who wanted to use their modeling as a force for good and to work with the brands they truly believe in. The idea of an ethical modeling agency started to form and, about a year later, I got introduced to (my co-founder) Val via Marcy Zaroff who had heard us both express similar ideas. We knew instantly that this agency had to happen. Q: You’re a busy lady! In addition to Role Models, you have several big things going on, including your podcast HeyChange and all of your own work as a conscious influencer creating meaningful content. What inspires you to keep going, to keep creating and connecting people around these important topics? A: Honestly, mother nature does. I’m lucky to live with a man who appreciates the outdoors just as much as I do, and we try to get out there and go on hikes as much as we can. When we can’t spend a weekend outside, I try to visit our city’s (for the time being, that’s San Francisco) many parks. When I’m out in nature, I reconnect with my core and I get reminded why I’m doing this. I remember how important it is that we work for a sustainable future and why I love doing what I do. Yes, my schedule is crazy, with days spanning from 5:30 in the morning to 9 at night, but I’ve chosen it for myself. But, don’t get me wrong, there are definitely days when I just want to pull a blanket over my head and hide away and omg, there are even days when I actually cry. It’s become sort of my husband’s duty to every now and then pull me in close and just say “alright, just let it out” as tears are streaming down my face. It’s the stress that inevitably builds up, it’s the climate depression that sometimes gets too much too handle, and I have days when I ask myself if any of it even matters. But I’ve learned that you have to let it come and you have to let it out, and then you replace that emptied space with new, regenerative energy. So I guess my answer to the question is: crying, hikes and warm hugs, haha! 1. Soil health! I just read Kiss The Ground and it blew my mind. Little did I know that we’ve depleted our soil for almost all of human history from our farming and that we can actually sequester carbon, rebalance the climate, AND produce more food if we can just learn how to do farming right. Soil is such a valuable asset and we need to start regenerating it before it is too late. 2. Fashion. Even though there are no “real numbers” industry professionals still agree that the fashion industry is one of the most polluting ones in the world and it’s only getting worse. I’m a huge advocate for second hand and using what’s already yours, and then when you occasionally buy new make sure you support natural, ethical and sustainable fashion! Two great resources to check out are Re/Make and WHo CAREs Chronicles. 3. Waste management and recycling. We REALLY need to rethink how we use our resources and completely change how we think about waste. There is no such thing as “throwing away”. All our trash ends up somewhere and that toxic waste is slowly killing our planet. We might feel good about recycling, which is definitely better than letting things go into landfills or our oceans, but recycling is a complex business that takes a lot of resources, money and energy. And, most of the things we put in the blue bins don’t even get recycled. The question we have to ask ourselves is, "how can I use less?" And then companies need to follow and change everything from packaging to shipping and the economy at large. Q: If you could speak to young girls everywhere today what is the #1 thing you’d like to share? A: Know that you’re powerful and that your qualities are important to our world. Don’t try to be “just like a man”, be a woman! Did you know that on the Drawdown list of the 100 most efficient ways to reverse global warming, “educating girls” is in the Top 20 and “making women small holders” also makes the list? That’s right, women know how to do it right, so own that title and make it your mission to be the best and most empowered woman you can be. Q: You describe yourself as a “Stubborn Climate Optimist” - What is your vision for the world in the next 10 years and how can we start today to make sure we get there together? A: My vision: We’re closing up on 100% renewable energy worldwide (fossil fuels were banned years ago - just in time! ), plastic is a material of the past and human kind has completely changed how she thinks about food, consumerism and fashion. Yes, a lot of change has happened in only ten years but, (thank god) we listened to all the marching kids and their concerns about their future and decided to get to action. Things were getting so bad with flooding, wildfires, droughts and toxic waters that we didn’t have any choice, and as soon as the governments came together and joined forces for a better world, it was incredible how fast it all happened! If you think I’m a girl who dreams big, you’re absolutely right - and when it comes to our precious planet, what choice do we have? I’m a stubborn climate optimist because I have to be, and I know that future can be reality, we just need to act now to make it happen. Treat every day as a day you can do a little bit better and select politicians that are fighting for our survival, not our destruction. Only when all our trees are gone will we realize we can’t eat (or breathe) money. A: Understanding that sustaining myself and my own health is and will always be priority one. Because if I’m not well, balanced and happy, there is no way I can work for a well, balanced and happy world. For many years I’ve run the rat race trying to do it all, without giving myself a chance to stop and reflect. Many times it’s gotten me very sick or at least run me down to where I don’t really function anymore. I’ve learned how to respect myself and my own boundaries, and from there I can only do more good. I’d answer: It feels… exciting… beautiful and…incredibly important. A: It means that you understand that you have the power to influence other people and so you must do your best to make sure you influence them to do something good. We all play a part in the social network we call life, and the sooner we realize that, we can make great things happen in very little time. To be a Social Icon to me means that you’ve chosen to be a light and you’re using your social platform to spread it.